Act fast – pre-sales for Wicked Weed Angel of Darkness bottles go live at 12pm EST. Allotments of 6 or 12 bottles will drop via Brown Paper Tickets here. This is a wild one, literally – American sour ale aged in sherry casks with boysenberries, raspberries, blackberries and cherries, coming in at 11% ABV. A public on-sale will be held Saturday, December 12th at 12pm at The Funkatorium. Limit 6 bottles per person. Wicked Weed Brewing is located at 147 Coxe Ave in Asheville , NC. Asheville Beer Week is throwing down from May 23-31, so you already know Wicked Weed Brewing is gonna get after it with both barrels blazing. Part of the week’s festivities include a double bottle release on Sunday, May 25 featuring the debut of Passiflora Blanc alongside a taproom favorite, Oblivion Sour Red. 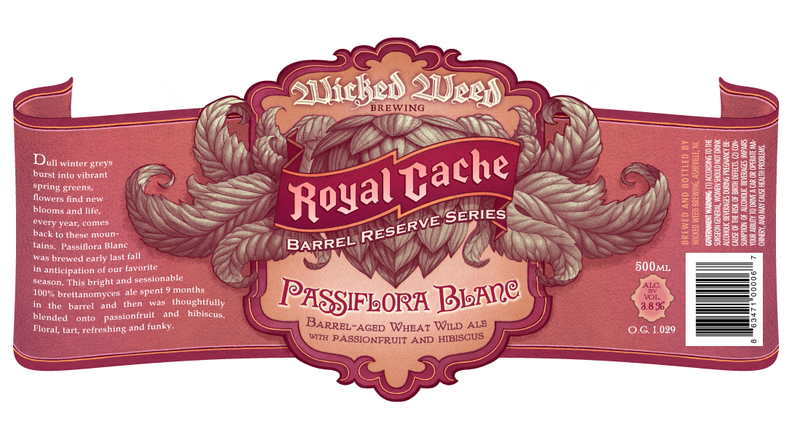 Passiflora Blanc joins beers such as Indulgence and Amorous in the brewery’s exclusive one-off barrel reserve series, Royal Cache. This is a 100% Brett-fermented wheat wild ale aged in oak barrels for 9 months, then blended with passionfruit and hibiscus, finishing at 3.8% ABV. Also on the bill is Oblivion Sour Red, which is sour red ale aged with blackberries and dates aged in red wine barrels for 12 months, coming in at 8.5% ABV. Bottle sales will begin at 11am, with an early-entrance VIP hour beginning at 10am for the first 100 people in line at noon, no VIP hour. Prices and limits are TBA. Wicked Weed Brewing is located at 91 Biltmore Ave in Asheville, NC.